This class is for pups who are from 8 weeks of age until 18-20 weeks. I have always disliked six-week courses, as this implies that all dogs and their owners learn at the same pace. All dogs and owners are unique in my experience and should be treated as individuals. So, owners and dogs are welcome to join the classes when they wish to, rather than waiting for the onset of a new course. Handling, teaching your puppy that it is nice to be handled by you and other people. Socialization to other people and other dogs. How to teach the puppy to be on his/her own. 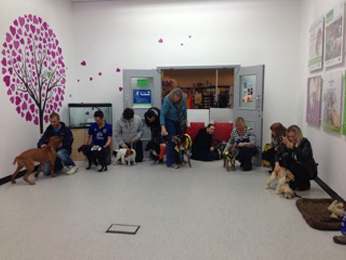 This class is for dogs more than 18 weeks of age and under one year of age, who do not have any behavioural problems. This class follows on from the topics covered in the baby-puppy class while taking into account the influence of hormones on behaviour. This class is for those dogs who have graduated from the early stage or adult beginner class and whose owners have already installed basic manners to the dogs. Everything is done off lead! At most other dog training classes, everyone and their dogs sit around and, perhaps for 5-10 minutes out of the hour, they are on the floor being taught something. What this means is that for the other 50 minutes, both owner and dog get bored and may lead to great embarrassment for the owners if their dog doesn’t perform the exercise. At my classes, everyone is doing something at all times and no owner is singled out in front of others. If you have any questions at all, or would like to come along to classes, then please do feel free to contact me. I welcome people coming along to watch any of my classes (without their dog), but please contact me beforehand. Interested in our dog training classes? Contact us for more information or to book a class.